Construction and destruction. Full throttle or topple? What’s more valuable today, data or money? The “The Future of Money” discussion at the recent Sibos conference had “the new oil” – data – firmly in its sights. “Money is foundational,” stated one of the three panellists, Ather Williams III, head of business banking, Bank of America Merrill Lynch (BAML). “Data is more valuable than money,” was an opinion of Richard Koh, founder and CEO of fintech firm M-DAQ Group. But all three agreed: data needs to be applied and interpreted in a meaningful way that benefits both the customer and the financial institution. “There is too much data out there, too much noise,” Koh said. And quite often, the interpretation of data can do more harm than good, if applied incorrectly. For example, a data analysis of ice cream sales on a beach in summer might show a spike in sales, Koh said. But if someone drowns by that beach, does it mean that the increased ice cream sales have caused it? Of course not. We are now moving from the world of “Fintech 1.0” to “Fintech 2.0”, which, using data science, technology and culture, will “really reimagine banking”, Koh said. This is the world where Starling wants to become “the Amazon of financial services”, Caywood said. “We are a tech company with a banking licence,” she stated. “We are mobile-first and mobile-only,” she stated. The future has no place for physical branches for Starling, she commented. BAML’s Williams, however, was less radical about brick-and-mortar. “It’s about balance of digital and physical,” he said. “Branches are not going to die.” Their purpose, though, is changing. BAML, for instance, has transformed its branches from transactional places to sales and advisory, to help clients deal with more complex queries and/or making big financial decisions (e.g. taking out a mortgage). “Look at Amazon,” Williams said. “Whilst the company started as pure online, it is now opening physical stores.” Ouch, Starling. What a Swell Sibos we had. Innovation on all layers for true digital banking. Myths on regulatory sandboxes debunked. Ethical bank leaping into the current account market. Be gone, financial messaging integration nightmares. Central banks and fintech – future perfect? Are banks and regulators up to the challenge? I know what I am doing! It’s an epic journey, not a day trip. Out of office – curiosities, frustrations and mishaps of the fintech world. 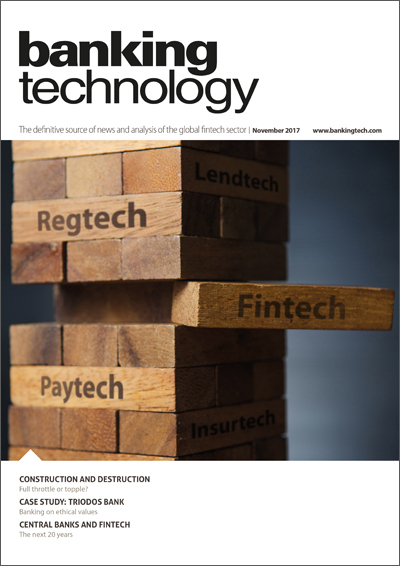 Click here to read the digital edition of Banking Technology November 2017. Australian broker Macquarie Futures has begun using a cloud-based reconciliation service from Gresham Computing and Amazon Web Services, which the broker says will help it to make its North American derivatives business more efficient. A price comparison site is rumoured to be in the works. The nation's rules must be updated for the digital age. San Francisco-based start-up will still operate independently.